A long, but powerful movie that defnitely takes patience to appreciate and enjoy. This is a tricky movie to navigate through. It’s a challenge, and requires a certain level of energy and comitment, but that’s only because the movie is so smart. The dialogue is extremely well-written and the actors really bring it all to life. Daniel Day Lewis, in particular, gives it his all to completely embody this historical figure. The story is interesting, especially when we are given explanations about why the events that are happening are so important to history, and why it is essential that they happen now, before the civil war comes to an end. while there’s a lot to like about the movie, there are also some problems. The length is one of them, coming it at two and a half hours. So is the disappointing ending that doesn’t show all that it should. Still, this is an interesting film made by a director who is probably the best filmmaker suited to make this kind of movie that is working today. 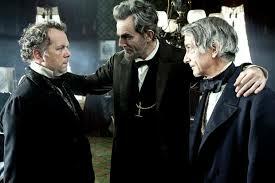 Lincoln is a tough movie to get through. that’s because it’s long and it’s wordy. In some ways, it’s like watching a slow play and in other ways, deciphering what is happening feels like reading Shakespeare. Making sense of the conversations is not nearly as challenging as that, of course, but even still, it takes a certain level of patience and commitment. The first time I saw this movie, I didn’t care for it at all. Since then my opinion has changed, but I still recognize that this is not an easy movie to appreciate. The main problem is that the movie is not very exciting. There is one quick clip of the civil war and a battle-taking place, at the very start of the movie, and then that’s it for violence. Instead, every scene is a conversation. Lincoln, himself, is a very wordy man, and the movie gives him all the time he needs to say what he has to say. Sometimes that includes lengthy stories just because they end with a joke. The movie is two and half hours long, and it’s a challenge to sit through it all at once. But like any great challenge, if you embrace it and try hard to make sense of it and understand the conversations, it can actually be pretty enjoyable. That’s because Daniel Day Lewis here, is giving another remarkable performance and everyone else who surrounds him is also incredibly talented. The cast here is a long list of familiar names and faces in small parts. From David Strathairn to Michael Stuhlberg, to the main supporting figure, Tommy Lee Jones (playing Thadeus Stevens), this one is loaded with well-known actors. There’s Jared Harris playing Ulysses s. grant, and sally field playing Mary Todd Lincoln. Joseph Gordon Levitt is on hand here as Lincoln’s son, and there’s a group of men hired to persuade people to vote a certain way, playing by three likeable actors (James Spader, John Hawkes, and Tim Blake Nelson.) my only problem with all of the casting is that there is no real black actor involved here in any significant role. Gloria Reubens, from TV’s ER back a long time ago, is the closest we get. It would have been nice to see a Forest Whitaker or a Cuba Gooding Jr. making an appearance. Still, the lack of black actors is just a small complaint here. the main thing is that as far as performances go, the actors involved in this movie are pretty great. Daniel Day Lewis really embodies Lincoln, getting the look and voice down perfectly. Sally Field and Tommy Lee Jones are both, also, pretty great. in fact, every actor here brings the dialogue to life with the right level of passion, showing off how well written the screenplay must have been. the story itself is about the last few months of Lincoln’s life. the civil war is coming to an end soon and everyone knows that the north will win. Lincoln knows that if an amendment is going to be made to the constitution, saying that slavery is illegal, it has to happen now, before the war ends. once the south rejoins the union, if Lincoln does anything to stir the pot and make the south leave again, he will be seen as the president who drove the country apart. the movie does a nice job of setting up how important this moment in history really is. everything here is about timing, and that includes Lincoln not accepting peace agreements to end the war, until the decision about slavery has been passed. the movie is filled with countless conversations and debates about this very topic. they are interesting for a while, but sooner or later you realize that you are basically hearing the same thing again and again. the best thing about the movie is the different small stories and characters. there is one man, for example, who Lincoln goes to see about the way he will be voting. this man’s brother was killed in the civil war and blames black people for that. another character is on the verge of switching over from being a republican to being a democrat. Stevens convinces this man to stay a democrat until after the vote, and to vote for the abolition of slavery. that way the abolition side will get one more democrat vote that agrees with them. a big problem with the movie is its massive length. at two and a half hours, this movie could have easily trimmed off thirty minutes and been all the more exciting because of it. the movie really drives on the audience’s patient and doesn’t give a whole lot back. for example, there isn’t very much excitement going on here. every now again we get one fun scene, like a man trying to shoot James Spader outside of a bar, but mostly the movie is just one conversation after another. 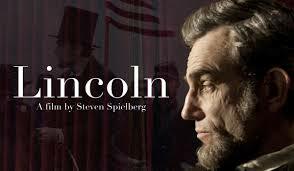 Steven Speilberg, who is clearly a masterful director, made Lincoln. this man has made lots of powerful historical films over the past twenty years, from saving private Ryan to Schindler’s List. I’m surprised he hasn’t made a movie about the diary of Anne frank yet. with Lincoln, he does a pretty good job of staying true to the time period and the epic feel. but he doesn’t reward the audience enough for their patience. I’m still disappointed that the movie avoids showing Lincoln’s assassination, if for nothing else, because I would have liked to see John Wilkes Booth jump to the stage and address the audience. there are definitely things left to be desired here, but Lincoln is still a good film.